A Wonderwall of a Bitter Sweet Symphony. 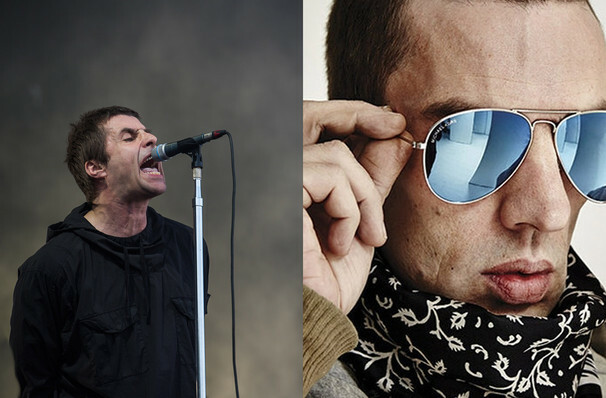 Why See Liam Gallagher and Richard Ashcroft? Britpop fans rejoice! Our leading men are joining forces and heading out on a North American tour this spring. Join Liam Gallagher and Richard Ashcroft for a night of soul fuelling jams as they celebrate their lives as solo artists. With both stars heralding from the giddy days of Oasis (Gallagher) and the Verve (Ashcroft) they certainly know a thing or two about making rock tunes, rejoice with the gents as they revel in their positions of Britpop gods. The soundtrack of the night will be Gallagher's brooding debut solo album, 'As You Were' which came out in 2017, with Ashcroft sampling tunes from his 2016 release 'These People'. Gallagher has been a long time fan of Ashcroft's work, which sparked some snipy insults from Gallagher's estranged brother and former band mate, Noel. 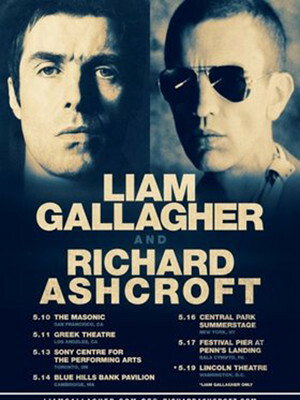 Please note that Liam Gallagher will be performing a solo gig (without Richard Ashcroft) at Washington's Lincoln Theatre (05/18). Sound good to you? Share this page on social media and let your friends know about Liam Gallagher and Richard Ashcroft at Sony Centre for the Performing Arts. Please note: All prices are listed in US Dollars (USD). The term Sony Centre for the Performing Arts and/or Liam Gallagher and Richard Ashcroft as well as all associated graphics, logos, and/or other trademarks, tradenames or copyrights are the property of the Sony Centre for the Performing Arts and/or Liam Gallagher and Richard Ashcroft and are used herein for factual descriptive purposes only. We are in no way associated with or authorized by the Sony Centre for the Performing Arts and/or Liam Gallagher and Richard Ashcroft and neither that entity nor any of its affiliates have licensed or endorsed us to sell tickets, goods and or services in conjunction with their events.